Figure 1. Plan of Union Point, Greene County, Georgia, annotated with an arrow indicating site of the James A. Thornton House.. Figure 2. Detail showing Greene County and vicinity from Morse and Breese's map of Georgia, 1842. Until it was deconstructed and moved, the James A. Thornton house was located at the end of Carlton Street on the southeast side of Union Point in Greene County, Georgia. Situated about 1,000 feet north of the railroad crossing that terminates the street, the house faced almost due south. In the spring and summer of 1997, the house was dismantled for reconstruction with alterations in Highlands, North Carolina. The house has been traditionally attributed to James A. Thornton (1803–1878)), the eldest of three sons of the noted Thomas Redmon Thornton (1769-1826), whose house at Union Point was itself moved in the late 1960s, first by the Atlanta Art Association to a site behind the High Museum in midtown Atlanta and then final reconstruction in Stone Mountain State Park. James’s brothers were Vincent Redmon Thornton, a prominent Baptist minister buried at Bethesda Baptist Church, and Jesse Thornton, who was named for his grandfather. James and his wife, Sarah, married about 1824 and their first child, William R., was born the next year. James’ father died in 1826 and, by the terms of his will, James received “all land south” of his father's home-place along with six slaves. The next year, James sold over one hundred acres of that land to James Pollard and, in 1828, he conveyed a 113-acre tract on “the headwaters of Sherrill’s Creek” along the Augusta Road (now U.S. 278) to his mother for $100. This was the tract of land on which he built his house. In 1831, the elder Sarah Thornton conveyed the same tract to William Cone, a neighbor, in trust for James’ eldest son William R., who was then only about six years old. Rice and William’s History of Greene County, Georgia (1979 reprint, original 1886 publication), states that James was a teacher under Greene County’s “Poor School Fund” between 1825 and 1838, and he appears to have taught school much of his life. He probably taught at, if he did not actually start, the Thornton Academy that was chartered by the Legislature in 1827. In 1838, he was teaching in White Plains, where his brother Vincent was also pastor of the local Baptist Church. James (not Joseph, as the original census entry has often been interpreted) Thornton appears in the 1850 census of Greene County (#730) with his wife, Sarah, and six children. Seven other children, all sixteen years of age or younger were also listed with James Thornton’s family in the 1850 census. Some or all of these additional children may have been students of Thornton, whose occupation was listed in the census as “teacher.” Fifteen people apparently occupied the house that year. Thornton claimed real estate worth $2,500 and sixteen slaves, the latter an indication that teaching was not his only occupation. By 1860, Thornton may no longer have been teaching school and listed his occupation as "farmer" in the census that year. He claimed real estate worth only $1,800, but he declared $3,300 in personal wealth, although the value of his thirty African-American slaves was most likely much more than that. Figure 4. View north of James A. Thornton House (c. 1830) on its original site in Union Point, May 1997. Figure 5. Front and east end of Thornton House. The log structure in the foreground was probably built in the twentieth century. Figure 6. Rear and west end of Thornton House. Figure 7. East end and rear of Thornton House. The Thornton House was probably constructed in the late 1820s. If James Thornton built the house, he is unlikely to have done so before his father’s death. The house must have been there in 1834, however, when he conveyed a 200’-wide strip across the land “whereon said James Thornton now resides” to the Georgia Railroad Company for construction of one of the country’s earliest railroads. “Thornton’s Crossing,” which later became the town of Union Point, soon was a local landmark. Although the house may have been constructed in the late 1820s, there were indications in the general character of the nails and other materials of the house itself that suggest that the house was not finished until the late 1830s or after. It was possible that the house did not reach its present configuration until the 1840s. Because the interiors had been mostly dismantled when the present investigation was conducted, conclusions regarding the building’s evolution were mostly drawn from the variations in the framing and other materials that could be observed. Typical of most surviving early nineteenth-century vernacular buildings, the Thornton House as it stood in 1997 was not built all at once but was rather the result of perhaps two major building campaigns. Built in the plantation-plain style, a variation on the ubiquitous I-house, the house was two stories high, end gabled, with a one-story, shed-roofed addition constructed across the rear at a very early date. The house sat on brick piers ranging from 4' to 5' high. The house apparently never had a front porch and was quite similar in that regard to the noted Henry Hilsabeck House near Madison, Georgia. If there had been a front porch on the Thornton House, even an antebellum one, it would surely have left abandoned mortises in the front sill and these should have been visible when the siding was removed and they were not. Rotting of the original sills at the three exterior door openings (all of which themselves appear to be original) did not allow for definitive proof of the nature of steps, landings, or porticos at these locations. The plan of the main block of the house was two rooms flanking either side of a central hall that continued through the one-story range of rooms at the rear. These rear rooms (including the rear half of the hall) were almost certainly antebellum in origin but they do not appear to have been part of the original construction. 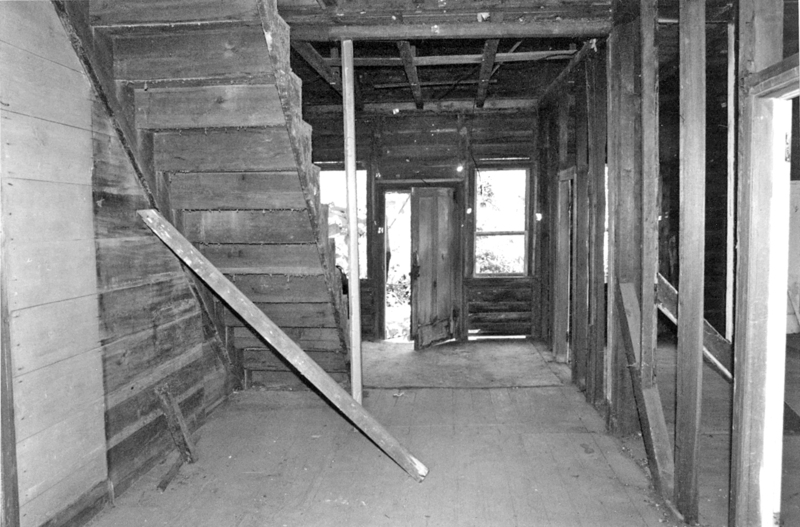 On the other hand, a porch and/or rooms must have originally been present across the rear since there was no evidence in the attic over the rear rooms that the rear of the house was ever sided and the staircase, which appears to be in its original location, runs from the rear rooms to the second floor. It is possible that the house originally had a porch and possibly a room across the rear and that these were subsequently enclosed or rebuilt entirely. This would help explain the use of log floor joists in the addition (typical of many antebellum porches, e.g. the Atlanta History Center’s Tullie Smith House, even when the main structure of the house was framed with sawn lumber) and also the mortised sills and/or top plates that were salvaged from some unknown location and reused in the addition. Figure 8. Plans of first and second floors of the Thornton House. The house sat on twelve T- shaped and L-shaped brick piers, generally 12" thick, set at each outside corner and at the intersection of each sill, where pegged lap joints were generally used for the connection. The piers ranged from 49" high at the southwest corner to 58" high at the southeast corner and somewhat higher in back. The house had four exterior chimneys that served fireplaces in each of the house’s main rooms. The two serving the four fireplaces in the main block were constructed of a very hard, high-fired brick whose color ranged from maroon and wine to a dark charcoal color. The brick in the two chimneys at either end of the addition were much softer and more typically orange in hue. The piers and cellar walls appeared to have used a combination of these bricks. Figure 9. West chimney base, August 1997. Figure 10. The front and east end of the Thornton House, August 1997. Figure 11. 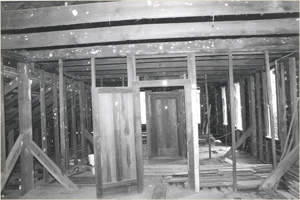 Second-floor framing, looking west. Figure 12. West gable of Thornton House. The southwest chimney rose from a base about 43" by 67" that corbelled two courses to the shaft which itself runs straight from the bottom of the sill to about 6" above the second-floor windows. At that point, a double course was set about ½" beyond the sides of the shaft (the face runs straight from sill to top) followed by eight courses that corbel to the chimney shaft. The shoulders of the chimney and the corbelling of the base were probably originally parged. The top of the chimney, which was about 36" wide (4 bricks), probably originally rose at least 12" above the ridge line but the top courses had been lost. The southeast chimney was of similar construction although its base was about 69" wide and its depth had been doubled by the addition of a brick base beneath the hearth. The rear chimneys, which only required one flue, were slightly smaller, measuring about 38" by 62", although the northwest chimney base had, like that on the southeast chimney, been widened by the addition of a brick hearth base. The rear chimneys corbelled only one course to the shaft at the sill level. The upper portions of these chimneys had already been removed at the time of this investigation. Beneath part of the front of the main hall (101) and part of the southeast room (103) a cellar was added, perhaps in conjunction with construction of the rear chimneys. The space measures about 10'-9" by 24’ and had a clay floor that allowed less than six feet of headroom. Four square windows, minus what were probably six- or nine-light, single-hung window sash. Deep wooden shelves lined the west and north walls, both of which were brick. The east wall of the cellar was, for unknown reasons, constructed of vertically-installed boards. The house was constructed with a modified braced wood frame, mostly pine but with some oak and chestnut in the rear addition. Sills, girders, and posts were all mortised and pegged together. Studs were also mortised into the sills and girders, except for the studs that intersect corner braces and there nails were used. The rafters were also nailed together and not pegged as was typical before the 1850s. Machine-cut nails were also used for attachment of nearly all siding, wallboards and trim. Very few modern wire nails associated with twentieth-century repairs were noted. The original construction utilized a combination of mostly sash-sawn joists, studs, and rafters and hewn sills and corner posts, typical of the second quarter of the nineteenth century. The sills were between 10" and 12" square. The corner posts, which were hewn from 12" square timbers over 19' long, ran continuous from the sill at the first floor to the top plate of the second floor. Girders for the second floor joists were mortised into these corner posts and to intermediate posts where cross walls intersected. The corner posts were cross-braced at each floor by sawn knee braces that were mortised and pegged to the posts and sills and girders. Figure 13. Center hall, looking north (rear) of Thornton House. Figure 14. East end of second floor. Figure 15. 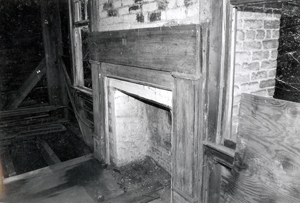 Mantel in east front room on first floor. Typical of the era, the dimension of sawn framing lumber was not uniform. The joists in the main block of the house were sawn with a reciprocating saw and ranged from about 4" by 8" at the first floor to 2½" to 3" by 8" at the second floor. The second floor ceiling joists were about 3" by 9". Most of the floor joists under the rear addition were whole logs, ranging from 6" to 10" in diameter, with the tops hewn flat. The ceilings at the first floor in the main block were set at 10' and those at the second floor at 8½'. In the two rooms of the addition, ceilings were set at 9'-9". Window and door openings, all of which appear to have retained original jambs and interior and exterior casing, were framed with 4" by 6" sawn posts. Studs, including the entire rear wall of the main block, were 2" to 3" by 4", with the narrower dimension predominating. Hewn timbers with abandoned mortises, probably from another structure, were used in the addition as top plates and window posts. Most of the original sash were missing and, of those that did survive, only one or two still retained their muntins. No glass remained in any of the sash. Remaining muntins were uniformly narrow, ⅝" stock except for a very few later modifications. Stiles and rails of all remaining sash were run from 1⅛" stock and were mortised and pegged together. Several wooden window stops remain in place on window jambs. All of the siding, which was sawn with a reciprocating saw, was around 6" wide by ¾" thick, laid with a 5½" to 5⅞" reveal using machine-cut nails. Exterior doors and windows were trimmed with plain 1" by 4" casing and header with a very narrow drip edge at the top. Window sills were approximately 6½" wide and 1½" thick. Neither sill nor drip edge extended beyond the edge of the vertical casing. The house had been painted in the past although only a few remnants of that paint (probably white and probably dating to the nineteenth century) survived in sheltered areas under the eaves. In spite of the lack of paint, most of the exterior siding and trim, all sawn from old-growth timber, was in relatively good condition. Figure 16. Plan of foundation. Figure 17. Sections of typical cornice details. Figure 18. Typical door details. Figure 19. Typical window details. The boxed eaves on the house were mostly intact although badly rotted in places and missing some elements. As with all of the moldings in the house, the exterior moldings appear to be hand-made and not machine-made. As a result, there was considerable variation in actual dimensions and profile, although typical patterns were the carpenter’s aim. The cornice on the rear addition differs somewhat from that on the main house but both have cornice returns on the gable ends. The return at the northeast corner of the rear addition had been lost and some of the original, triangular crown at the top of the fascia has been replaced with a more modern crown molding. A simple band of triangular molding similar to that on the fascia was set about 6” below the top of each front corner post and was probably used at the rear posts as well. The roof was originally wood-shingled and most of the original open decking remains in place. A wood-shingle roof (probably not the original) survived on the main roof beneath layers of asphalt roofing. The rafters of the shed roof over the rear addition were from a later modification when the rafters were replaced and the roof raised to a point just under the rear eaves of the main house, some 36" above its original location. The side-wall framing for the original roof was still visible in the attic. The existing shed roof was covered with sheet metal roofing. 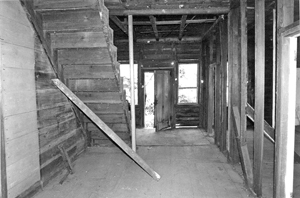 Although the interior had already been mostly stripped when the present investigation was conducted, a few of the original tongue-and-groove wall boards, approximately 11" to 12" wide, remained in place in the hallway. Wallboards in the other rooms had been dismantled but not yet removed from the house. The mantles, except for the one in 102, remained in place. Most door and window frames and casing remained in place but the back-band had been removed. The floors were laid with tongue-and-groove pine floors, approximately 6" wide. Although there had been some water damage to the floors, especially at each end of the house and at the doors, the flooring itself was in relatively good condition for material of its age. Flooring appears never to have been varnished or otherwise finished. All door openings were about 6'-6" high and 3'-0" wide except for the doors in the rear addition, which were about 2'-10" wide. Most of the interior doors survive but the exterior doors, except for the back kitchen door, had been lost. The doors into Rooms 102 and 104 were missing their panels. Surviving doors had two vertical panels, molded on one side only. The panels were set into grooves in the stiles and rails, which were run from 1¼"-thick stock and mortised and pegged together. The panels were missing from the door into the southwest room (Room 102). The door at the rear of the main hall (Room 101) may have been relocated. It was the only one of the doors with panels that were beaded along each vertical, molded edge. Windows in the main part of the house appear to have been similar, although most of the sash were missing and much of the trim had been removed. Set about 31" from the floor, the windows in the main house measured about 2'-4" by 5'-6" and had a 9-light movable lower sash under a 9-light fixed top sash. The windows in the rear addition measured about 2-4" by 4'-8", set about 32" from the floor, and had a 6-light movable lower sash under a 9-light fixed upper sash. The two windows in the gable ends of the addition were 6/6 and measured about 2'-4" by 3'-10". The interior door and window casing was similar to that on the exterior but with the addition of a molded back-band in at least two different profiles, a simple rounded window stool in at least three different profiles, and a plain 1" by 4" apron. Most of the moldings on the interior and exterior of the house were hand-made, not machine-made. As a result there was considerable variation in dimension and profile between individual pieces, although all resemble typical patterns of the period. Window stool profiles, for instance, varied considerably, with those in 103 being especially distinctive. The mantles, like the molding, differed slightly from room to room with the one in the southeast room on the first floor (103) being the most elaborate. This room might have been the formal parlor and may have been the room that was finished first and used the longest. The house apparently had a detached kitchen originally but since at least the late nineteenth century, the east room (105) in the addition must have been used as a kitchen. Hardware, except for door hinges, was mostly missing although a few elements remained, including a surface-mounted lock on the door on the north side of Room 105 that may have dated to the second quarter of the nineteenth century. Ghosts of surface-mounted rim-locks and trim, similar to that at the back door of the kitchen, were visible on the doors.